Nancy leathem's Trees and Branches: Edgar Waters, 1925-2008.Folklore collector extraordinaire. Obituary. 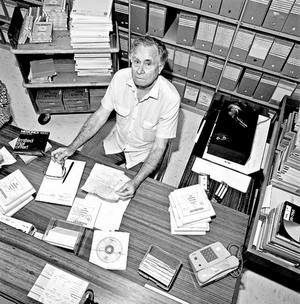 Edgar Waters, 1925-2008.Folklore collector extraordinaire. Obituary. EDGAR WATERS, scholar, folklorist and social historian, brought a sharp intellectual approach and an unwavering historical rigour to the emerging field of Australian folklore. His exceptional knowledge influenced some of the pivotal moments in folklore studies in the second half of the 20th century. He also brought a generous spirit, which encouraged and informed even while maintaining a critical stance, and a lifetime of research simply for the love of learning. Waters, who has died at 82, was born in Sydney and grew up in Casino, northern NSW, during the Depression. His father, Eric, was a bush worker who died before his son reached 12; his mother, Thelma Matilda Lancaster, worked as a cleaner to raise the family. Edgar matriculated early from Casino High School, applying for a scholarship at his teachers' insistence. At just 16, he entered the heady world of Sydney University at a time when thinkers such as John Anderson and Ian Maxwell held sway. There he met Ann Barnard, who shared much of his ideals and whom he later married. Although his brother, Darcy, became a leader in the influential Sydney Push, which grew out of the Andersonian Libertarians, Edgar rejected Anderson's philosophy, opting for a commitment to the left, which led to him joining the Australian Communist Party. He resigned in 1957, when his discontent over a sponsored tour that included Soviet Russia was confirmed by the 1956 invasion of Hungary. After editing Rebel Songs in 1947 with Stephen Murray-Smith, Waters worked at the State Library of NSW, where he met Russel Ward, the historian who was to write The Australian Legend. Ward suggested that Waters, with a friend, Jeff Way, undertake a recording in 1953 of Joe Cashmere, a bushman, singer and musician who knew a wealth of songs. Waters shared the recordings with collectors Norm O'Connor and John Meredith and Cashmere's repertoire became an integral part of Meredith's collection in Folk Songs Of Australia. Waters travelled to London, immersing himself in British and Irish folklore, meeting such figures as Peter Kennedy, A. L. (Bert) Lloyd, Seamus Ennis, and Ewan MacColl and working as Alan Lomax's research assistant, including on the seminal Folk Songs Of North America. He returned to join Peter Hamilton, co-founder of Wattle Records in Sydney, travelling via a Communist youth meeting in Warsaw. Wattle was a critical success and, for a short time, a commercial one. Its first release of a recording of pioneering revivalist band, the Bushwhackers, was a chart triumph. The recording of revival albums such as Gary Shearston's The Springtime It Brings On The Shearing, or MacColl and Lloyd's Convicts And Currency Lads were critical successes. LINK TO BROTHER DARCY WATERS.